Warrant of 2017 comprises more members from the first record release than most other bands that started their activities in the 80's do and the four of them have steered the band forward with grit into new directions and realities over the last decade. I guess that nobody would expect this group of people to come out exactly as they did during their glory days around the two first records, Dirty Rotten Filthy Stinking Rich (1989) and Cherry Pie (1990) and especially after hearing the last record, Rockaholic (2011) with the then new vocalist Robert Mason. Or do people on the contrary expect such an outcome overall and think it's normal to make the same stuff that you did in your 20's even though you have passed 50 now? In the latter case I believe that some people will get very disappointed with what Warrant puts out today because a lot of things are quite different as an effect of simply just being more mature. The sound quality is stronger and fuller and the actual performance is of higher quality than what it was in the past and the feeling of being rock 'n' roll has even increased over the years. However, the sense of youthful energy is now missing and gone are most of the lightest ballads and the really greasy stuff which I didn't appreciate in the first place anyway. The whole band seems inspired to make the best possible music that they can and I think their decision to try to come out with fresh stuff instead of trying to replicate the classic material is a wise choice to not end up with some kind of embarrassment as a result. I wouldn't say that it's like a new group that has written and recorded this album though, because don't forget that the band became heavier already on album 3-5 in the 90's and that this one is just an extension of the last record in a sense. 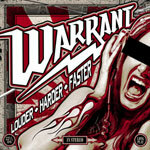 Warrant of today maybe isn't able to create to greatest songs of their career and Louder Harder Faster doesn't include the smash hit material that the band put out soon 3 decades ago. Yet I think that it's a valid outcome as a whole and the band definitely shows with the new stuff that they still want to be in the game today and hang around for a bit longer than what, I guess, many people would have thought when these guys put the old band back together again in 2004.